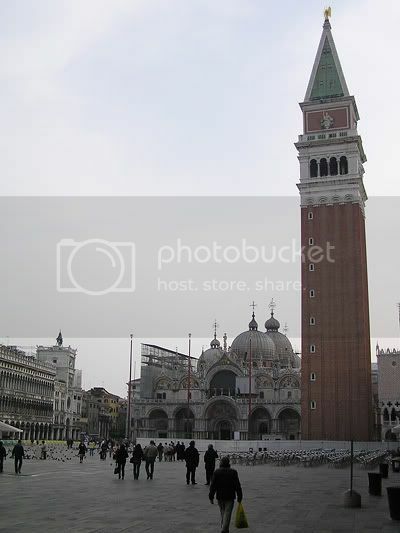 San Marco's Campanile, something you cannot miss if you're looking through pictures of Venetian landmarks. 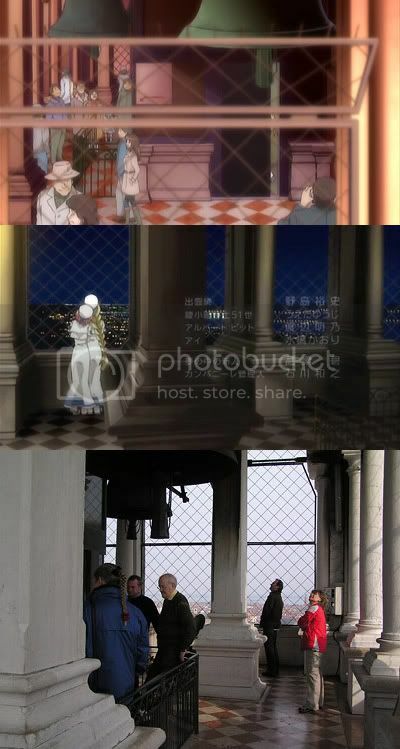 ARIA the OVA ~ ARIETTA does a highly detailed coverage of this landmark. Everything has an entrance (duh) and the entrance to the Campanile is art in itself. It is highly decorated and some moments to appreciate it is needed before entering. A very close look at the statues reveals ARIETTA has accurately portrayed them exactly. The clutter of what look like tables in my picture are actually wooden planks for people to walk on when the place gets flooded during acqua alta. It is the lowest elevation point in Venice. Now for ordinary folk, the entrance fee to go up is a mind-boggling €8 (as of April 2008). Everyone also goes up the elevator which ironically is manufactured by SCAM (yes, I'm being serious). I did indeed feel getting duped by a scam paying that fee. Thank goodness Hahi-chan has Alicia in tow, as they actually go in through the exit! They then go up the stairs which in ARIETTA was absolutely magnificent. 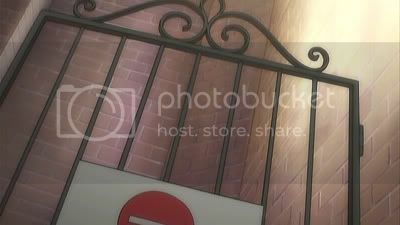 Unfortunately, the jolly public is not allowed to go up the stairs, and this is implied with the metal gate and the "no entry" sign. The gate in real life is of identical construction of the one in ARIA with the passageway taking a 90 degree left turn - accurately portrayed. No pictures as it's really not something a person would take a picture of so you'll have to take my word for it. Alicia and Akari sure must have strong legs from gondola rowing, as the Campanile is at least 10 storeys high! They emerge at the top from a trapdoor. Now, this metal trapdoor really exists and I saw no other viable location of where the stairs would come out. The trapdoor has a souvenir kiosk very slightly covering the edge. This didn't escape the eye of the ARIETTA producers as can be seen below. One of Hahi-chan's first remarks was "Sugoi, sugoi!" and it really is that fantastic, and dare I say a prohibited embarassing statement, magical. 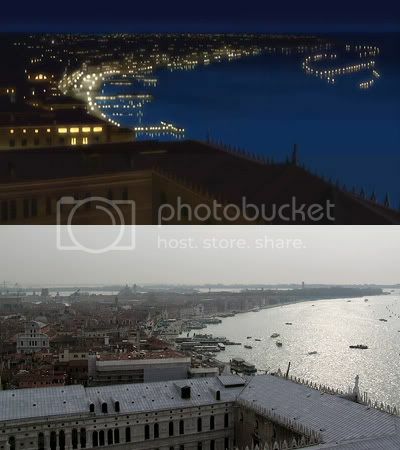 The view is simply breathtaking and you really see an unusual view of Venice. I was simply speechless. The €8 fee suddenly felt worthwhile, since people my age burn that amount of cash to get pissed. If you ever go to Venice, cough up the money and go up. It's well worth it. 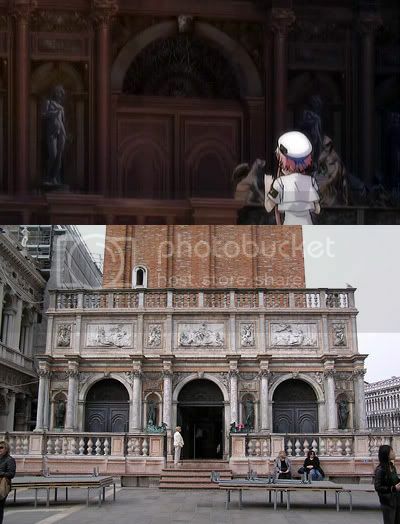 A comparison of the view of the Piazza San Marco, and you can see the accuracy of the patterns on the ground. Basilica di Santa Maria della Salute with the island of Giudecca in the background. The art of ARIETTA is very geographically accurate. 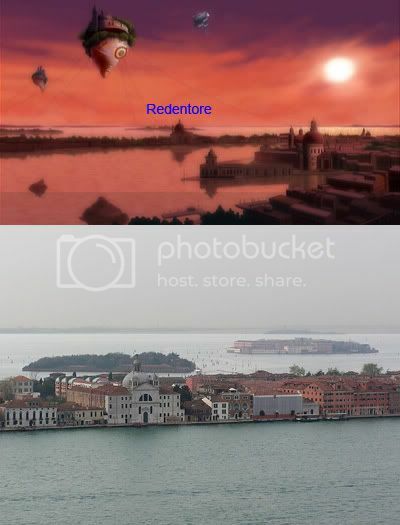 Here, we see that they have properly included the Il Redentore in Giudecca in the background. Thank goodness for my 10x zoom! You can see two small islands behind Giudecca in my picture. ARIETTA also has them included very accurately. Guess what? Even the position of the setting sun is accurate. Looking eastwards along the coastline, the angle in ARIETTA bears remarkable resemblance to the picture I took. Every detail was drawn - even the shape of the lit windows correctly. The lights in the water are for navigation purposes - there are set channels to navigate as most of the Venetian lagoon is shallow. We also saw Alicia, Akira and Athena earlier, getting deafened from the bells. The bells are literally right above your heads and you can touch them if you jump. This video by thiruvai shows that you can indeed become deaf up there! 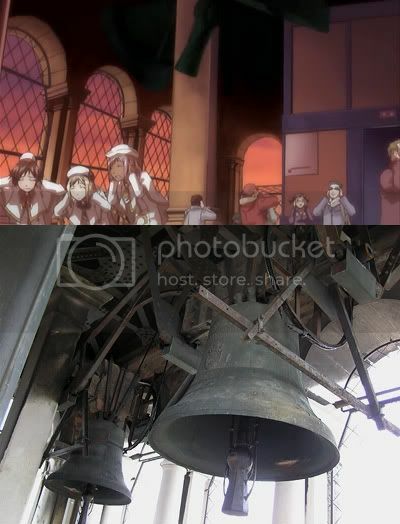 When you compare the sounds of the real bells with ARIETTA, they are exactly the same. 100% accuracy. For the real eagle-eyed nerds, skip over to 18:07 of ARIETTA and you can see that the elevator doors are precisely drawn, much like the real thing as seen in the Youtube video. Last but not least, the interior of the Campanile. Every detail has been drawn in ARIETTA, from the pillars, the pattern of the flooring, and even the railings to enable people waiting for the elevator going down had been done with 100% accuracy. So what can we say about the work of the ARIETTA crew in their representation of the Campanile? Well, it's not as spacious up there as portrayed - it's actually quite tight! Also Piazza San Marco being devoid of people and with no clutter at all? No, this place always has people around, and the clutter of the alfresco dining tables from the likes of Cafe Florian! The above in my view is fairly trivial though, and I think the accuracy is mindblowing but as always, you're the final judge! P.s. Hahi-chan says "This is the direction which faces ARIA Company isn't it?" near the end. She is facing East. I will come back to this sometime in the future! Hahi~ It's really accurate! I'm really sad about not going up that tower, when I was in Venice. 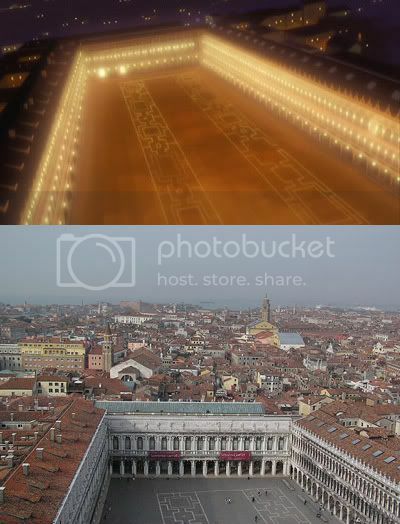 Now I have something for you, what is strange, nor accurate: In Origination Ep 5 at 15.50, Neo-Venezia is shown from bird-view, and it's shape is different! While Venice is shaped like a fish swimming in the sea, in that episode Neo-Venezia has lost it's "tail", and the Arsenal with it. I just checked that out and you're absolutely correct. The Arsenale and the whole chunk of the Castello region has been wiped out! Now, I think that airshot was inspired from a manga chapter which was skipped in the anime. In that chapter (Page 104, ARIA v11), Amano-senei drew it correctly and everything's in it! Simply excellent - the level of detail you're pursing is going to push this blog into the limelight. You can't imagine how many other ARIA fans out there are wondering how real it all is. 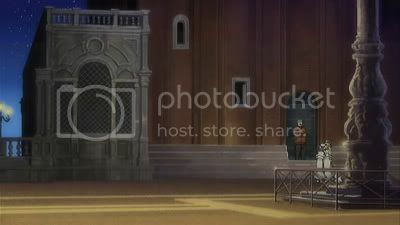 I think the very first Aria animation episode also has a different Venice (seen in birdeye position when Momiko arrives on the transparent spaceship). There the Canal Grande or the Guidecca canal looks like a dead end. 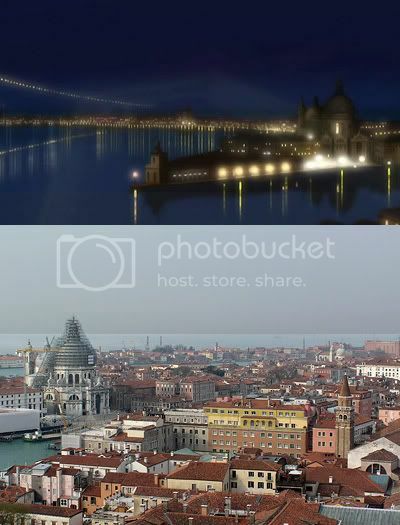 Otherwise, the best viewing place of Manhome-Venice is said to be the Campanile of St. Giorgio Maggiore island. That tower is a bit shorter than the Piazza's, but less crowded, cheaper and the sight is more revealing. From looking at maps, the Campanile of St. Giorgio Maggiore island would give an unobstructed, panoramic view of Venice!